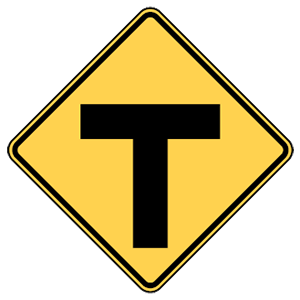 This sign indicates that a T intersection is ahead. 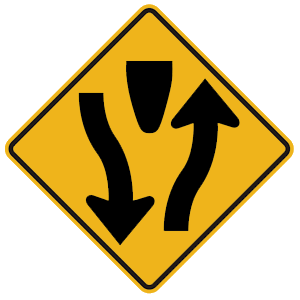 Where may drivers make a U-turn? Near the top of a hill. Where they will not disrupt traffic. 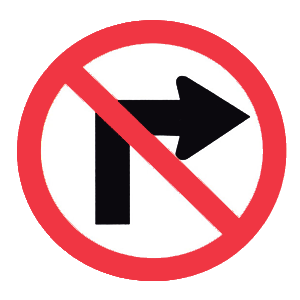 A U-turn is a 180-degree turn resembling the shape of the letter U and reversing the direction of travel. You may not make a U-turn unless you can do so safely and without disrupting other traffic. Stop before entering any crosswalk. A red traffic light means that you must stop before entering the intersection. You must at any stop line and before entering any crosswalk.